This is the first ever non-profit Sikh movie to be funded by the community. Our vision is to create 19 further movies over the next 10-15 years for our children. This is why we do not want any business, investor, or corporate entity of any kind to reap all the profits. We have more than 300 volunteers who all share this vision and already giving their free time and skills. We are now looking for people of all skills and backgrounds to get involved in helping us with Fundraising and Marketing. Whether you can hold an event, reach out on social media, speak to local businesses, or your family and friends. Have a look at some of the examples below of the various campaigns our volunteers have launched. These have helped to promote awareness and raise funds. It’s well known that Guru Nanak Dev Ji started a social revolution. When his father gave him 20 rupees as a business investment, telling him to come back with a profit – what did the Guru do? With the mind and heart of a true leader, he spent all the money feeding the poor. Thus, the legacy of “langar” was born – free food available to anyone who needs it. Guru Nanak started this social revolution with 20 rupees over 500 years ago. Today we’re asking everyone living in the UK to get involved in a digital revolution by donating just £20 that will fund 20 movies over the next 10-15 years. That’s it – it’s super easy. If you wish to donate more you can do, but we are appealing to everyone living in the UK to try and donate at least £20 if you can afford it. By donating – you too can be part of this amazing journey, look back in 10 years and say “I helped build a legacy for the next generation”. 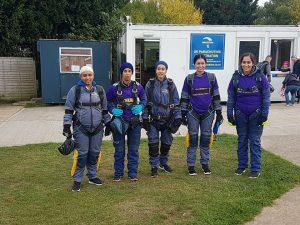 On 7th October 2018, a group of women did a Charity Skydive to raise funds for #MotherhoodTheMovie, based on Mata Sahib Kaur Ji – the Mother of the Khalsa. They felt incredibly passionate about the cause, especially as the movie is about sharing the untold story about this incredible female leader and inspiring girls/women by empowering them in their daily lives.  During the very first campaign that was launched, a number of families across the world gathered to submit pledges for the Worlds First 3D Animated Movie Seva Project. People began to donate and this started a viral campaign where everything, young and old donated towards the movie.